How To Stay Live in Challenging Times!! Are you confident in your self-defense skills? 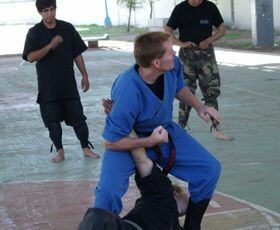 REALITY: You can not learn practical self-defense skills in a few days or weekend seminar. They must be internalized to the point of being instinctive. If not, your skills are useless. Everyone needs a strategy for defending themselves physically and mentally. Self-defense is not about being stronger or more aggressive. It is about maximizing your potential to improve your chances in any situation. 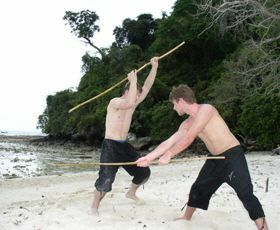 It is a fact that strength, size and speed are major factors in a physical encounter. And yes, a person who is lacking in these areas can learn to develop certain techniques to improve their outcome. STORY: I remember being in an elevator with a champion kickboxer and friend. The elevator came to a crashing stop and we could hear things fall from above. This happened very fast and my hands immediately shot up to protect my head and be in a reactive stance. My friend reacted too but more naturally trying to brace himself. Luckily, we didn’t have the roof caving in over our heads and we go out of the elevator. Bringing my hands up to protect the CPU or brain was a reaction. I didn’t have to think about it. There is a kind of cool attitude attached to not flinching, I used to practice this with my brothers when I was a kid. But there is nothing cool about having a piece of metal sticking into the top of your head. Reactions are important and that is why a typical self-defense program will not work. 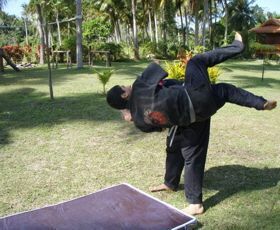 You need specific training and drills that help you to instill a reactive mind and prepare you for unexpected events. You need a routine and an environment to practice. What could happen if you don’t learn proper self-defense strategies? 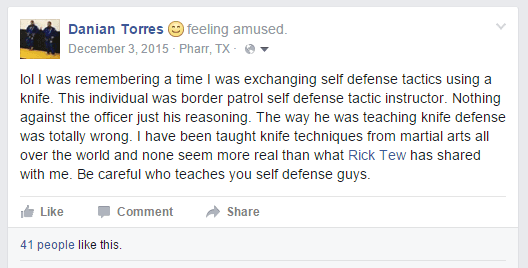 What could happen if you do learn proper self-defense strategies? Life is about feeling confident regardless of where you are. You want to feel more confident in your self-defense skills. This is self-defense for the average person. Yes, those that are physically more capable can learn a lot from our program too. We tailor our focus to beginners and those that are looking for a unique edge that isn’t available from cookie cutter programs. The PSC Personal Security Course provides you with the ability to do the best you can when protecting yourself or others. It is nothing like what you might confuse with what is seen on TV or in the movies. These situations are an illusion. REALITY: It is unrealistic to believe you will be 100% effective in a situation requiring you to defend yourself or others. Yes, you must expect the best and plan for the worst. 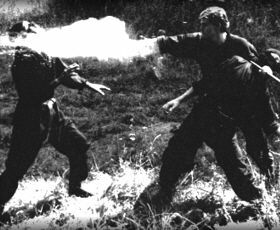 The goal of the PSC program for self-defense is to improve your base chance of survival through a series of unique training strategies. 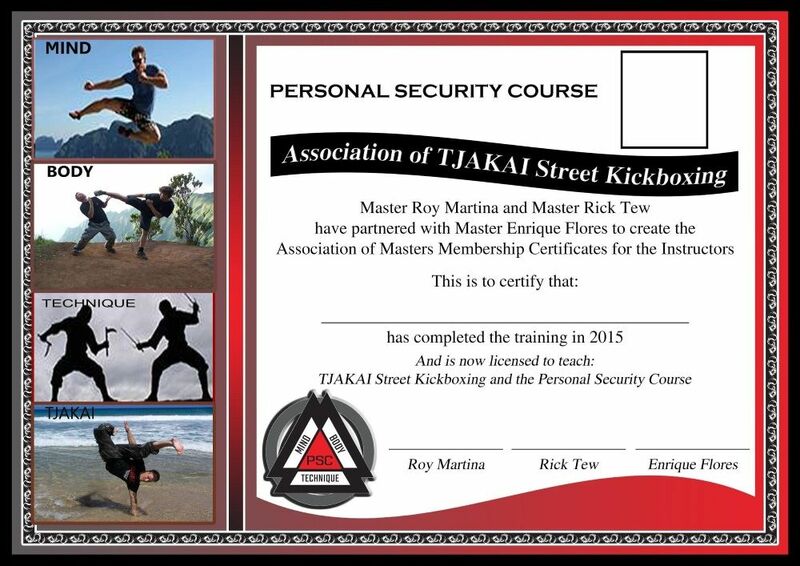 The Personal Security Course was created by a 20 year veteran in the martial arts. Having taught and trained in Europe, Thailand and America, Rick Tew is focused on providing high quality personal classes to all his Students. 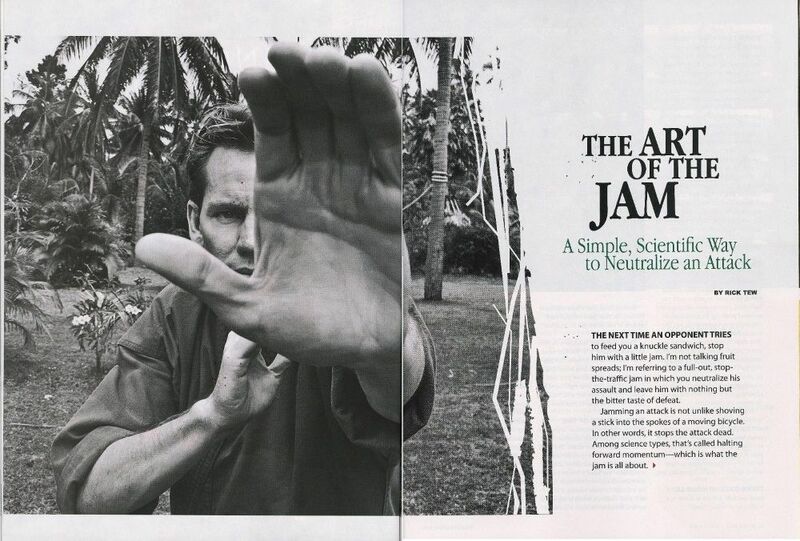 He has appeared in Black Belt magazine and has been in the industry long enough to have people copying his programs and camps on a regular basis. 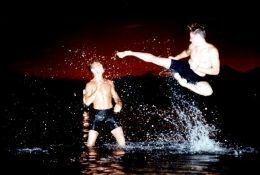 Can I learn self-defense even as a beginner? PSC offers a simple but effective solution for the everyday person. It is about your Personal Security and how to improve it. No we do not use a fancy name and we are not a branch of the military. We take a different approach. Oddly enough, people that understand the psychology of a defender are people just like you. A person with a heavy background in the military or the police does not see the world the way that a typical civilian does. We use tactics and techniques that help match your personality to improve your performance. There are only so many things you can or cannot do when learning about self-defense. What you can do is choose an environment that feels right for you. 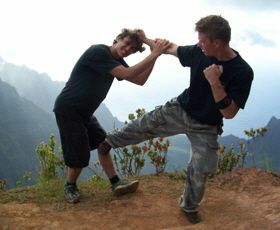 Combining his experience teaching martial arts and psychology of human behavior, Rick Tew offers a complete 1-3 month program on improving your life by enhancing your confidence and self-defense foundation. Our strategies are designed to take your base skill level (chance of survival) and immediately double that level within the period of 1 month. This may seem like a lot but it really is only the first step. Why is self-defense important and the theories behind the personal security course. What is a natural response and how can we go about making this a part of our being? How can we protect the most important part of our lives. Determining your foundation skill level in PSC and understanding the principles that make take it to the next level. Physical strategies for self defense and targeting the body with primary striking areas and why. Weapons of the body and how to use them. What it most practical and why. To act or not to act. When you strike or when to use your head and how. How to use simplicity, strength, surprise and strategy to your advantage for self-defense and applications. Breaking the grips of detainment, both Physical and mental. Three strategies that can make the difference between life or death. Concepts that can make the difference between being in the right place at the wrong time or the wrong place at the right time. Dealing with fear and how to overcome issues that would normally be debilitating. Can I really double my skills in only 1 month? Actually this happens usually in the first week. But you need to understand how and why this happens. Let’s say that your current base provides you with a likelihood of security at about 10%. The skills you learn in the first week may increase this base percentage to 20%. So 20% is not very high, but it is a 100% increase and you just doubled your foundation. The goals is to work on this concept to great more solid ground. A foundation is only possible with a routing training program. That is why we offer a live-in full focused program for 1 month. 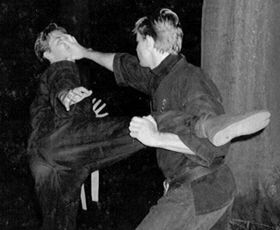 Looking at self-defense from the perspective of a physical attack, you must realize that being assaulted and harmed does not mean your skills were not practical. Maybe you would have been harmed more if you had not spent at least some time training. The goals is always to improve that base percentage. 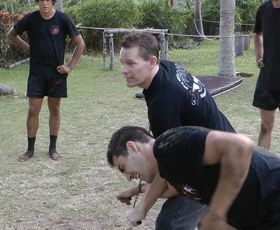 We teach you how to improve your ability to defend yourself with our unique Personal Security Course and self-defense training program. 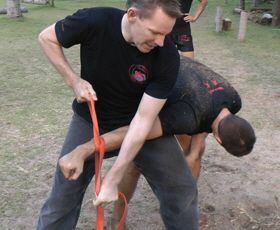 We do this by improving on your existing strengths while also improving the area where you are weak. A month seems like a long time to spend away from home. Would you take a month out of your life if it meant it could save you an entire life? Can you take a week out of your schedule and return at a later date for another week until you have at least 4 weeks invested into your PSC? The reason we can get these strategies in place for you is because they require a certain routine. We have trained students for a number of years and one thing that seems to be existing in everyone is that they forget. Learning a skill or tactic takes the right amount of training in a unique way to get it to the be a part of you. Also, Rick Tew teaches in a friendly conversational manner and has the patience to really help you to grow. You are learning from a person that has been on this path his whole life. Most others have jumped on the bandwagon for financial gains. You are not limited to the enrolled training programs when working with us. REALITY: Yes, you need to invest a minimum of 1 month into learning strategies to help you perform at your peak when the time is needed. Our program is unique in that we build around the Student. Unlike many programs that want to drag you through the mud, we believe that is only effective if that is something you desire to do. Meaning, we focus on what you need and we create a fun environment for people to share, grow and gain a great experience. This is a program with other people just like you, taught by normal people that understand that grunting, aggressive minds and boots don’t make for a fun group. We tailor to educated people that need an edge up and that also enjoy great conversation and being with others of like mind. So many people are online pretending to be experts these days. Every person has the ability to increase their base percentage for self-defense. Imagine you arrive as you are now. Who will you be when you leave? If we put these two people face to face, who would dominate in combat. We would put all of our money on the NEW you. Because even if you did poorly, you would still be twice the man you were before you entered. Time to go for it and we can be kicking it soon - sign up now. Take advantage of our program and offer and we will schedule you in and be waiting for you to arrive. Since 9 out of 10 people sign up as much as a year in advance, we will be sure to keep in contact and you can let us know if your schedule needs to change so we can arrange a different time for you to attend. Usually people realize that they need self-defense skills when it is too late. Don’t let that be you. You can act in advance, get the right training, make some new friends and take part in an adventure too. There is a gift of fear that helps us to make choices that could affect our entire lives. Even if you feel safer or more confident as you live out each day, that alone is a wonderful gift. These programs are only available now. Tomorrow is a promissory note and yesterday is a canceled check. The only cash you have is today. Get started now to protect your future and get an experience worth a lifetime too. Training with Mr. Tew is a rare opportunity as he isn’t always in one place. We brought this special program to California and back to its roots near Yosemite National Park. Is it fun or all serious? Because we tailor our programs around the individual and we have strategy that is fun and flexible, there isn’t really a process of like or dislike. You already know if you like ice cream. We just want to give you more opportunities to enjoy it in peace. We don’t expect you to conform to something that isn’t comfortable for you because your pace is your own. You need to be able to perform and do what is unique to you. So we do our best to ensure that you are on the right track from day 1. What is the price you will pay if you don’t have confidence in your self-defense skills? You can not afford to not do this program. The value of your life is worth the cost of the course alone. But what we believe is the true wealth is the heightened confidence that you gain and can carry with you everywhere you go. It is far more than self-defense and it is based on self-confidence too.